Corsair claims its dual-compartment case has the best air-cooling case in the world. We investigate. 10 geek points to Anthony for mentioning the YY cube in the very first line! Man this is uber tempting. It reminds me of a cube chassis I had back in 2000. Love the design, and how you can separate the components.. If I didn't have what I do I would be all over this like a rash. I was seriously tempted by this last night, but decided against because of the limited watercooling options compared to my current case and the 900D which I am still looking at buying. If I was air cooling everything though then this would be on the top of the list instantly. I always wanted a YY cube but never managed to, but this looks like the case that I've been waiting for (I could do with more 3.5" bays but as I haven't got any optical drives I could re purpose those). Currently my entire comp is sat bare on a shelf using an M6 bolt as the power 'switch' so I think one of these will be purchased come payday ! 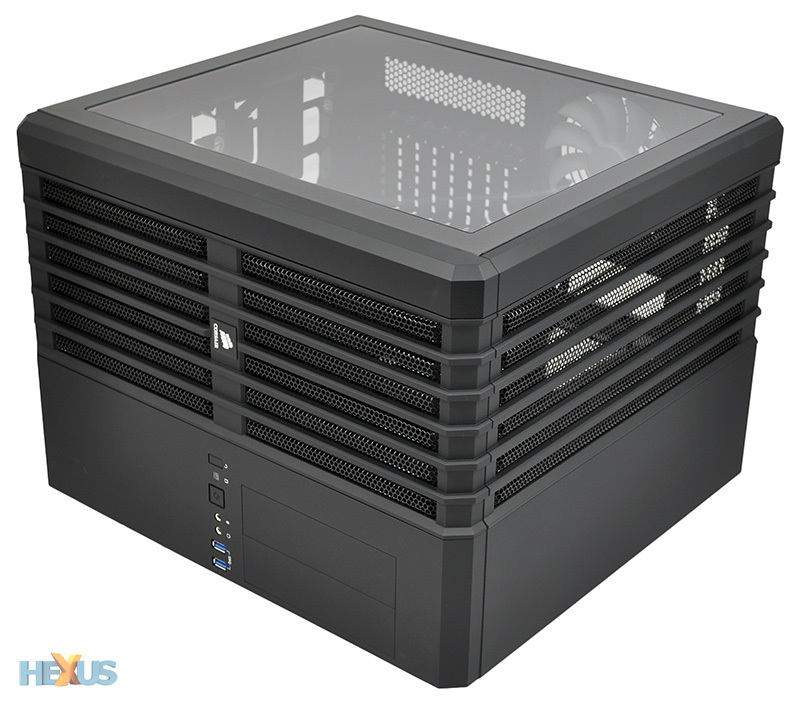 Anyone else think the case would look rather nice if there were feet on the right hand side of the case so you could lay it on it's side with the window facing up (http://img.hexus.net/v2/chassis/Corsair/540/Air540-03b.jpg)? Very tempting, however my next case will be mod of another case, so I have no need to get this one. I will certainly recommend it to someone who is in the market however. I bought a 200R on behalf of my brother, and it was one of the easiest cases I have ever built a system into, great bang for buck and I expect this to be no different. MMM do I sell my cosmos II and go small. Now rattling my brains. Vowed not to sucked into these smaller cases but now thinking twice about it. Case needs at least one 3.5" hard drive cage and also active cooling on the psu side for the hard drives - much like is seen on the MM UFO's. Mesh also at the bottom of the case, leaving it open like that looks a bit unfinished. (Also, a cover is required should the user not wish to use that area. A simple metallic plate would suffice). Oh, it also needs to be made in a white version. Looks an excellent case if I weren't a scratch builder I think this would be the one, nice layout. I agree, some nice knurled aluminium feet on the right hand side and covering up the holes under the 3.5" drive mounts (make the bottom the same as the roof panel?) would allow you to use it on it's side with the window facing up toward you, something different for a change. Sounds like you want a Cooler Master HAF XB with the top window panel - probably why Corsair stuck with the design instead of copying them. True but the Corsair looks loads better, has a smaller footprint and will be better quality. To be honest that was one of the original concept ideas, but we had to divorce ourselves from it for a couple reasons. 1) It would have required a ton of desktop real estate. Nobody would put that case on the floor that way, and the footprint of the case in that orientation is massive. Bigger than some laser printers. 2) It would have required adding a cosmetic panel to cover the bottom hard drive area, relocatable feet for the rear side panel, and a couple of other parts, all of which would have added significant cost. We'd be selling at $159-$169 instead of $139. So if the Air 540 sells, maybe I'll make an Obsidian version of the case with that option. But I'll need a few months to see how many of you guys are buying this thing before I determine if I keep going with the cube style cases. To be quite honest - it's very, very promising so far. Especially those reviews.